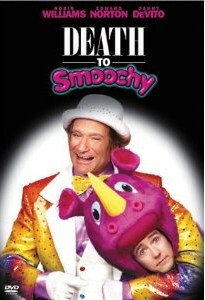 Death to Smoochy. Warner Bros 2002. I remember a time in this blog when I sought out movies generally considered bad to give them a chance at some small redemption. Looking back at recent selections, I guess I haven’t shied away from the duds, but I haven’t looked for them either. It’s my understanding that either this, Patch Adams, or Bicentennial Man was Robin Williams’s worst comedy film. I liked Bicentennial Man, and a look at the description for this movie sounds interesting. It could almost be a sequel to Mrs. Doubtfire, with Williams again playing an out-of-work children’s performer. All of the above isn’t to say that I went out of my way to find this movie, I just noticed that. When Rainbow Randolph, the nation’s number one children’s TV entertainer, is busted for taking bribes and all around corruption, Kidnet executives demand that the producers of the slot fill it with a squeaky clean host, and they get Sheldon Mopes’s character Smoochy the Rhino. Sheldon is so clean-cut he gets buzzed on orange juice and alfalfa drops and compares Captain Kangaroo to Jesus, and demands that the producers remove the bells, whistles, and razzle-razzle, that is, the merchandising and unhealthy messages. But despite his breakout success, the underbelly of the industry is not about to be swept aside, and neither is the mentally-unbalanced Rainbow Randolph. It’s no surprise that Robin Williams takes top billing despite being little more than a comic foil. This has all happened before and will all happen again. He’s actually quite effective in his role, and I’d consider him the third or fourth most important character. On the other hand, Edward Norton is good at finding the range between insipid idealist and sensible nice guy. It may be more to do with the writing, but I didn’t notice how the plot was working on his character growth until the moment he was pushed to the edge. The plot is mostly about Sheldon reacting to the real world, so a lot of the focus is on the people. The producers, the agents, the merchandisers, the people who take the kickbacks, but also the friends he picks up along the way. I couldn’t quite tell if Spinner’s Irish family had clout and connections or were just getting what they wanted on muscle and gumption, but they are formidible allies either way. Ultimately, I think what ruined this movie for people was, as usual, mismarketing. It’s disconcerting hearing so many f-bombs from Robin Williams, but it works for the character, and the viewer realizes at some point that he’s neither the hero nor the villain, but the comic relief, and at times needs either more story or none at all. He’s a distraction, and the marketing ran with it, ruining it for the audience like having a sip of cola but expecting the taste of milk. Watch this movie: with a clear expectation of what you’re getting. Don’t watch this movie: based on its cover.